I’ve relied on many translators and scholars in the writing of To the House of the Sun, and over the years I’ve been lucky enough to correspond with a few of them. Their specialties vary widely—Greek religion, Hinduism/Indo-European studies, Egyptology, Arthurian romance, etc.—and it seems that their enthusiasm and love for language, history, and religion are worth sharing. Especially since their areas of expertise can seem overwhelming to the layman, an informal interview, like a good introduction to a book, can be a great way into a new world. Cyril Edwards is a Senior Research Fellow of Oxford University’s Faculty of Medieval and Modern Languages, and an Honorary Research Fellow of University College London. He is the author of The Beginnings of German Literature and numerous articles on medieval love-lyrics, Old High German, and the supernatural. 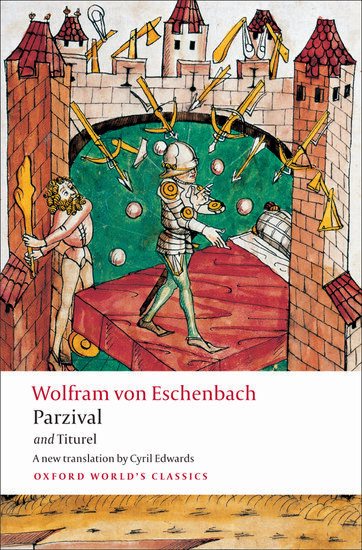 His translations include Wolfram von Eschenbach’s Parzival and Titurel, the Nibelungelied: The Lay of the Nibelungs, and Hartmann von Aue’s Iwein or The Knight with the Lion. Your webpage says you teach “German language, medieval and modern literature, cinema, and the history of the language,” and many of your books are translations from medieval German originals (Wolfram von Eschenbach’s Parzival and Titurel, the Nibelungenlied, the Iwein of Hartmann von Aue, etc.) How did you become interested in Middle High German? For instance, why not another language, or area of history? Was there a moment (a teacher, a passage in a text, etc.) that sparked your interest? The website stems from my time at St Peter’s College, Oxford, from which I resigned (along with quite a few others) 3 years ago. ‘Taught’ would be more accurate than ‘teach’, as I retired in August this year. I became a medieval Germanist by accident. I went up to Jesus College, Oxford to read French and German. I scraped through Prelims (the first-year examination), but felt that my French was getting worse and worse, so I switched to reading ‘German sole’ or ‘Single Hons German’. This meant that I had to study Middle High German, Old High German and philology. I took to it like a duck to water, especially MHG. One great inspiration was my tutor, Ruth Harvey, a great lecturer. (I dedicated my OHG book to her.) There are other, more obvious routes to MHG. My most beloved student was introduced to Walther von der Vogelweide’s ‘Under der linden (on which I’ve published a couple of articles) by an enthusiastic sixth-form teacher. My main student last year is now doing a postgraduate education course, and wants to introduce her students to MHG. I think the short lyrics are the best way in, especially if they have tunes. Initially I wanted to do my doctoral thesis on Theodor Fontane (on whom I’ve published the article in the Oxford Dictionary of National Biogrpahy) and Jane Austen, but my tutor at Jesus wasn’t keen, so I went with Ruth Harvey on a medieval topic. Not a good thesis, on Konrad von Wuerzburg. Similarly, the corpus of MHG texts being as large at it is, how did you choose to translate the works you have? Was it a particular affection for the text, the challenge posed by certain texts (Wolfram especially), or something else? Wolfram, too, fell into my lap by accident. When I was made redundant by Goldsmiths’ College, University of London, in 1994, Richard Barber of Boydell & Brewer kindly offered me the opportunity to translate Maier’s Dictionary of Celtic Religion and Culture, which prevented me going on the dole (unemployment benefit). Then I was also paid by Richard to translate the Grail chunk of Der juengere Titurel, on which we co-authored an article. Then Richard, preparing his great book on the Grail, rang me at home, and asked me if I’d like to translate Wolfram’s Parzival. I nearly fell off my chair in excitement. For 5 mins I thought about doing a verse translation, but, no. Jessie Weston’s early 20thC translation, in 2 vols, is troubled by cumbersome alexandrines. (Not as bad as Raffels’ translation fo the Nibelungenlied. That first night, into the early hours, aided by a good malt whisky, I had a bash at the prologue, which had always fascinated me. I looked at my translation in the morning. It was rubbish. (See my poem: ‘Sors translatoris’). You also call Wolfram’s Parzival “the greatest medieval Grail romance.” While I would agree, many in the English-speaking world still get their Arthuriana from Malory, or from modern/popular derivatives of him, or even Tennyson. What is it about Wolfram’s poem that, for you, makes it surpass not only Malory, but also Chretien and the French Vulgate Cycle, and so much else? Wolfram’s humour and his brilliant use of imagery are what, for me, makes him most special. Also, his subtle characterisation, something largely lacking in Malory. The O.Fr. ‘Quest of the Holy Grail’ is fine, with a good trans. by Pauline Matarasso (Penguin Classics). What is most gratifying for me is when lay readers respond with enthusiasm, e.g. the first lay reader on amazon.co.uk, who found it difficult to put the book down, as ‘it reads like a modern novel’. This response is like that of Yann Martel’s to the Nibelungenlied in ‘whatisstephenharperreading?’ A very intelligent critique. Two of your major translations, Parzival and the Nibelungenlied, have only been translated into English a few times, and up until your editions came out, the standards were those of A. T. Hatto, from almost half a century ago. What is the translation process like? How long did each book take? What were the particular difficulties/joys of translating each book? The hardback Parzival took 4½ years, appropriately, as that is the time Parzival needs to become Grail King (or Grail queen, as one mad student at Birkbeck had it when I examined her.) Then another 6 months to revise it for Oxford World’s Classics. The NL took about 3 years, I think. Line 2 of Parzival took, for example, 14 different drafts. It’s hard work, but very rewarding. Sometimes I still miss the work on Parzival. Towards the end I went mad. I had been reading lots of Vikram Seth, who introduces rhythms into his prose a lot, so I went for trochaic rhythms. Not consistently, but as often as I could. A couple of friends have remarked upon this, but no reviewer (as yet). As a pacifist, I hate doing battle scenes. They really bore me. Can you briefly talk about some of your other works—The Medieval Housebook, your articles on the supernatural and elves and witchcraft, and your translations of Bernhard Maier’s Dictionary of Celtic Religion and Culture, Edgar Wind’s Experiment and Metaphysics: Towards a Resolution of the Cosmological Antinomies? The Medieval Housebook was done for money. It’s the one book I’ve translated of which I do not have a copy. See amazon for the price! The essay on medieval mining was fiendish to translate. I spent a lot of time in the science library in Oxford; the author was very kind and admitted that many of the terms have no obvious English equivalent. The Wind translation (also for money) was done at the request of money. Fiendishly difficult, given that I failed O-level physics and had no grasp of Einstein or Kant. In the end I developed my own Kant glossary. Sometimes, having done 10pp in a day, I would look back, thinking I’d barely understood the meaning. Yet they tell me it’s a good translation. I just stuck, as I usually do, with the principle of translating as accurately as I could. As for Maier’s dictionary, I’d recently done a course on Old Irish, so knew rather better what I was doing. Moreover, there are so many bad books about Celtic mythology that it was a privilege to translate a really good one. Elves and witchcraft stemmed from an attempt to interpret Heinrich von Morungen’s beautiful song V; ‘Von der elben bin ich entsehen’. This led to a lot of fun research, particularly in the School of Scottish Studies in Edinburgh, and discovering the songs of the folksinger Duncan Williamson. And to subsequent articles. I never thought I’d write about the Loch Ness monster! I’ve lectured to witches at a bookshop near Covent Garden (which I now call Coven Garden). They were all kind and enthusiastic. What books or websites would you recommend for someone new to the study of medieval German literature? I’ve contributed to Ernest Schonfield’s (University College London) website on German lit., obviously doing the medieval bit. There are a lot of bad introductory books in English. My The Beginnnings of German Literature is, I hope, sound, but perhaps a bit tasking for the beginner. Brian Murdoch’s Twayne’s World Authors book on OHG is an easier read. Can you also talk about your cookbooks? I also hear you make t-shirts? The first cookbook is The Little Book of Soups & Stews (Abingdon: Elfking press, 2009). That is on Amazon, though the reviews are very obviously by friends. The 2nd book, The Somewhat Bigger Coobook, will be out next year, I hope. My sister’s illuss. are, as always, superb. She’s also illustrated The Allotment & The Black and the Green (a political novella and poems, seasonal political and venereal) Abingdon: elfking press, 2012. I’ve not bothered with an ISBN for that as yet. It’s mainly for family and friends. Yes, t-shirts, the latest being one of Walther von der Vogelweide. Also some co-compositions of tunes to Heinrich von Morungen, including the Narzisslied. Heather and I cobble them together in the pub. There is only one authentic tune, in the Carmina Burana, but if you work with the metre, sometimes tunes come into your head. Hartmann von Aue, Erec. A parallel text translation (Boydell & Brewer). It’s taking such a long time because the text is so long, much longer than Iwein – daunting. The editorial problems relate to the fact that this 12thC text survives for the most part in an early 16th MS, the Ambraser Heldenbuch, but there are 13thC fragments. Those from Wolfenbuettel are particularly problematic, as they’re in an early different dialect to Hartmann’s Swabian. It’s worth it because it’s the first German Arthurian romance and is written with such gusto. Codex Cremifanensis 264. An Upper Austrian housebook of c.1500, never before edited. Beautiful water-colours with gold leaf. This is nearing completion. It will be a transcription of the late MHG with a parallel text English translation. Minnesang: a bilingual anthology, due to appear with de Gruyter in 2013. There is no large-scale predecessor to this. A 2nd book of poetry: Crocus and Other Poems. Crocus has been translated into about 14 languages now. Das Narzisslied Heinrichs von Morungen. I’m co-editing this and it should be out in the spring. It’s a collection of essays on one particular (wonderful) lyric. I doubt if that’s been done before. Quite a busy retirement ahead of me.